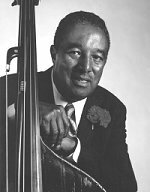 "Ray Brown, on bass, played the stongest, most fluid and imaginative bass lines in modern jazz at the time." Ray Brown was born in Pittsburgh and moved to New York around 1945 and immediately became part of the musical establishment. He took part in a number of early bop recording sessions with Charlie Parker, Dizzy Gillespie, Bud Powell, and others, and played in Gillespie's big band (1946-47), "Two Bass Hit" [mp3]. Thereafter he toured for several years as the music director for Ella Fitzgerald, who was at that time his wife. In 1951 he performed and recorded with the Milt Jackson Quartet (the forerunner of the Modern Jazz Quartet) and began a long affiliation with Oscar Peterson's trio, which brought him international recognition and a popular following; for more than a decade he dominated jazz popularity polls for the double bass. Following the example of Oscar Pettiford, he took up the cello, and in 1960 he had made for him a hybrid instrument combining features of the cello and double bass, which was a forerunner of the piccolo bass. After leaving Peterson's trio in 1966 Brown settled on the West Coast, where he became active as a freelance and studio musician, recording frequently for the Concord label; he made two albums of duos with Jimmie Rowles and at least nine albums with the L.A. Four. In 1972 he recorded an album with Duke Ellington, in which the two me re-created the latter's well-known perfomances of 1939-40 with Jimmy Blanton. In 1987 he toured in a trio with Gene Harris and Mickey Roker. Along with Pettiford and Charles Mingus, Brown has established himself as a leading bassist in the bop style; he is noted for the precision of his playing, the beauty of his tone, and the tastefulness of his solos. 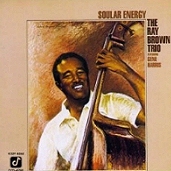 A selected discography of Ray Brown albums. This One's For Blanton, 1972, Pablo. Bam Bam Bam, 1988, Concord. Moore Makes 4, 1990, Concord. Don't Get Sassy, 1994, Telarc.